This is an absolutely stunning 3" German Brown Trout taxidermy fish mount. It is posed facing the viewer's right side with a slightly open mouth. This fish has a wonderful painting job, fins that are in perfect condition, and taxidermy work that is incredible, all of this combined has helped this item earn our Premier Plus™ overall quality rating. All applicable dimensions are included to help ensure this item will fit within your intended display space. 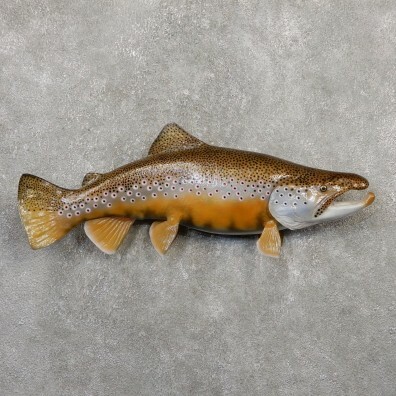 The Brown Trout is similar in general shape to the salmon, though its coloration is very different. The spine of the fish is dark, the belly is a cream color, while the sides are pale and flecked with a variety of red, orange or brown spots. Brown trout found before maturation can be distinguished by their bluish-grey spots, while adult males will also sport a curved lower jaw. The brown trout originate from Europe, but can now be found around the globe in streams and lakes from distribution and planting programs. The Lake Trout is a freshwater char found throughout most lakes in North America, popular in both cuisines, and sports fishing. They are the largest in the char family, but are rare now, due to overfishing. The Lake Trout is a slowly maturing fish species, and usually brownish-tan in color, with white speckles. The largest Lake Trout caught on rod and reel, according to the IGFA, was 72 lbs, 59 inches, caught in Great Bear Lake in 1995.